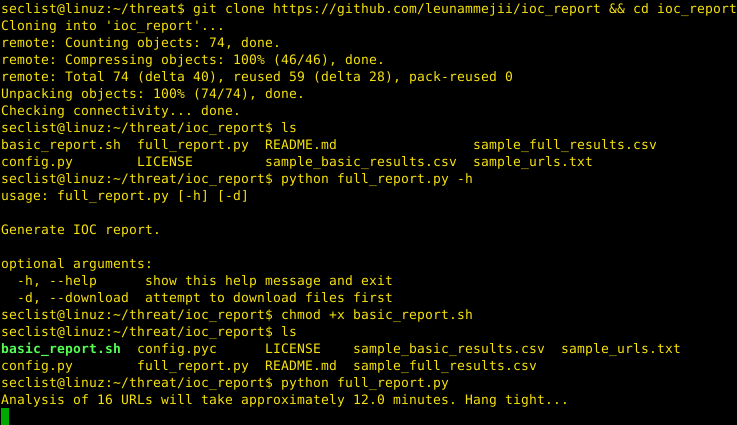 Browse: Home / ioc_report – ioc report generator. 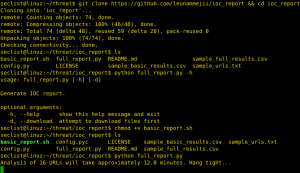 ioc_report is used as a tool to automate the process of using OSINT to find indicators of compromise (IOC) to sweep you environment for. Since this project was built around the public APIs, there is a rate limit. I used the VirusTotal rate limit (4 requests per minute at the time of writing this) as the baseline. Since the Hybrid-Analysis function of this script checks two environments (Win 7 32-bit and Win 7 64-bit), it takes approximately 45 seconds to pull the information for each URL provided when generating the full report. The basic report just provides the filetypes and hashes of the initial downloads so this should be 10x faster (FILE DOWNLOAD TIME x NUMBER OF URLS PROVIDED). If you have access to the private API, just remove the 15 second waits and everything “should” be fine. Is 45 seconds a long time? Sure it is but this gives you more time to go do something else like flirt with your crush at work or twidle your thumbs. The OUTPUTFILE was meant to be used as a lookup in Splunk in order to do more correlation with other log sources but as with any other open-source project, use it as you best see fit. If you are a Splunk master, manipulating the lookup table should be a piece of cake. The basic report, basic_report.sh, is used to pull down files and get the MIME-type, MD5, SHA256 hashes, and write the comma-separated data to a file. The full report, full_report.sh, is used to pull down files and get the MIME-type, MD5, SHA256 hashes, requests the hashes from VirusTotal for the ones that were no longer available on the site but previously submitted by another user, request more information (extracted files, hashes, filetypes, hosts, and IP addresses) from Hybrid-Analysis, and write the comma-separated data to a file. ← snowdrift is a unit testing for firewall rules.